CORVALLIS — They've know each other for a long time. They've played a whole lot of softball together. And, for the five seniors on the Tualatin High School softball team, there was no better way to go out. The five Timberwolf seniors — Taylor Alton, Ella Hillier, Kayla Laird, Zoe Olivera and Megan Woodward — finished up their high school softball careers by getting to celebrate a state championship, and an undefeated season, following Tualatin's 4-3 win over Clackamas in the Class 6A state title tilt, held Saturday at the Oregon State University Softball Complex. "It's a great group," Hillier said following the championship game. "I'm going to miss all of them so much. For some, it was their last game of softball today. I've played with Megan forever, I've played with all of them forever. It was a good last game to play with the girls on the team, it was good to end up on top." "We've played together for a long time," Woodward said of the seniors. "I've played with Ella forever, since elementary school. Since freshman year, we've all been playing together. It feels amazing to finish with them." This year's Tualatin team put together a 30-0 record. And, while it definitely seemed to be a team effort that got the Wolves there, the seniors certainly helped lead the way. "They mean everything. They're literally everything to us," Tualatin junior first baseman Emily Johansen said of the seniors. "We have Zoe in center, who's amazing. We have Taylor at third, and she's one of the best third basemen I've ever played with. Ella knows the game better than anyone. Megan is able to spin the ball and Kayla is huge. She's been huge in the dugout. She really keeps the energy up." "They're my best friends," Tualatin sophomore shortstop Bella Valdes said. "It's going to be really hard not having them next year. They contributed so much to the team. They're our leaders. They're the ones that bring us back up if we're falling down. They mean everything to this team, and they're really going to be missed." Alton, a four-year starter at third base, has played the most games of the seniors. During her four years at Tualatin, the Wolves have gone an amazing 102-12, winning state championships in 2015 (Alton's freshman season) and this year. "This is an amazing group of girls, and I couldn't ask for better teammates," Alton said of the seniors. "They're amazing, and we all just keep coming back together. It's going to be sad without them." "It was so fun," Olivera said. "We've all known each other for a real long time, so I feel like we already had a real good bond. We just really came together." And, of course, the seniors were leaders. 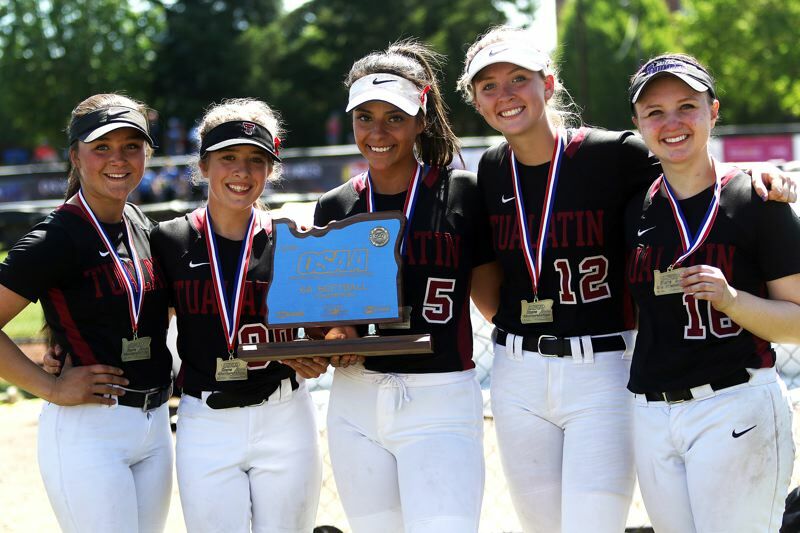 "They were so encouraging, and they wanted us to get so much better," said Tualatin freshman Taylor Corcoran, who drove in the game-winning run in the state championship contest. "They wanted to push us to be the best, and we did." "We're all leaders in our own way," Woodward said. "We all bring something different to the table. It brings a really tight-knit team, and we all love each other." In addition to the talent, cohesiveness and leadership, the seniors might have brought yet another key element to the team's success this season. "Heart," Laird said with a smile. "I've grown up playing with them. The heart of our group is just incredible. And the team behind us help us come together as a group."